East Aurora, NY, USA, October 18, 2017 – Moog (NYSE: MOG.A and MOG.B), a designer and manufacturer of high performance motion control products, solutions, has earned a safety certification from TÜV Rheinland for the new Moog Pitch Servo Drive 3. TÜV Rheinland is a global testing service provider and specialist for functional safety. Moog’s new Pitch System 3 is responsible for guaranteeing the safe operation of wind turbines. The feathering safety function supplied by the Moog Pitch System 3 Servo Drive alters a wind turbine’s blade pitch at the rotor hub to minimize the torque applied by the wind, avoiding excessive speed of the turbine. As a result, the pitch servo drive is classified as a safety component. 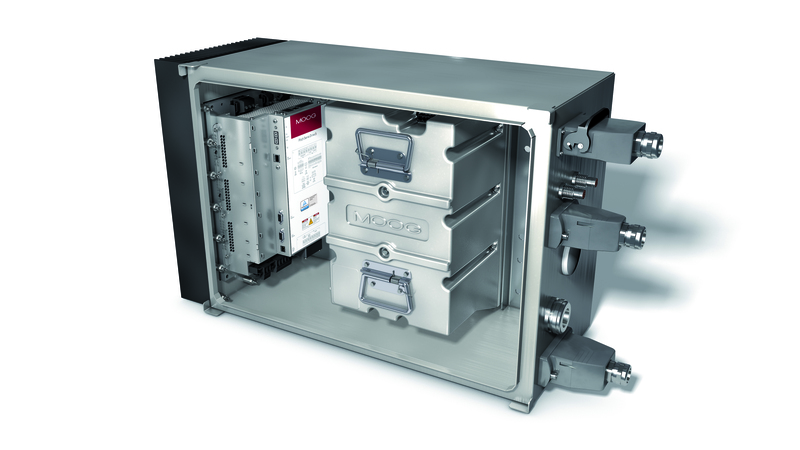 Moog established the benchmark for safety with its previous versions of the Moog Pitch Servo Drive when these were certified by TÜV Rheinland in 2012. With the Moog Pitch Servo Drive 3, Moog has received independent validation that this product will also perform outside the specification at extreme environmental conditions and in cases of unexpected failure. Along with certifying the safety of its new servo drive, Moog improved the architecture of Pitch System 3 to meet IEC 61508 and ISO 13849, standards governing wind turbine safety. First, Moog’s engineers provide a safety function referred to as Safe Feathering Run (SFR), which automatically moves and stops a turbine’s blades in the feathering position. Second, Moog included a Safe Stop function called (STOP1) to arrest the motion of an individual blade during manual movement of the blades. The Safe Stop function meets the ISO 13849 standard that addresses the requirements that blades must not perform an unintended move when people are working inside the wind turbine’s hub. Moog also asked lightning protection specialist DEHN to test Pitch System 3 (including its servo drive and interface module) inside a high voltage lab subjecting the system to multiple lightning strikes reaching more than 260,000 amps. Afterward, the system was still fully operational and performed a Safe Feathering Run. Moog Inc. is a worldwide designer, manufacturer, and integrator of precision control components and systems. Moog Industrial Group designs and manufactures high performance pitch solutions for wind turbines including pitch control systems, slip rings, blade sensing and services for wind turbine manufacturers and wind farm operators. Pitch systems monitors and adjusts the angle of the wind turbine blades and thus acts as a critical safety system protecting the turbine against adverse wind conditions. Moog Industrial Group, with fiscal year 2016 sales of US$515 million and over 40 locations worldwide, is part of Moog Inc. (NYSE:MOG.A and MOG.B), which has sales of US$2.41 billion. For more information, please visit www.moog.com/wind. Moog Pitch System 3: Axis Box including Pitch Servo Drive 3 and Pitch Capacitor Module.